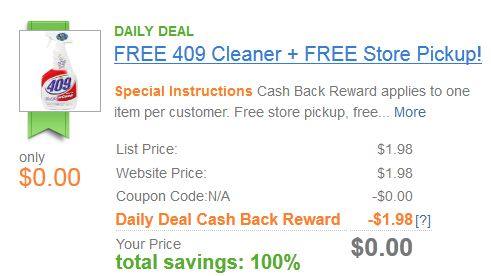 Free 409 Cleaner through Shop at Home and Walmart with free in-store pickup. Pay $1.98, and get $1.98 deposited back to your Shop at Home account! If you can't find the deal on the front page, just search "Walmart" and you'll see the above-pictured. Must go through Shop at Home to get this freebie! Sign up below. If you haven't signed up before, you can get a $5 gift card/credit!